You’re Indiana Jones, being menaced by Nazis in Karen Ravenwood’s bar in Nepal. You manage to croak “Whisky” in a husky voice as the giant Nepalese henchman bends you over the bar. 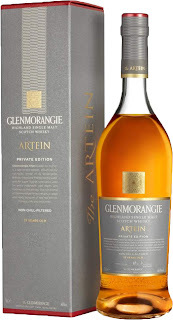 She goes off-script and instead of handing you a generic bottle that you can use to crown the thug, she puts a glass of Glenmorangie Artein in your hand. You’re baffled, not so much by her surprising action, nor by contemplating the rapidly-escalating cost of your chiropractor bill, but rather by the nose. It’s the smell of liquefied conflict diamonds and baby seal pâté on Wheat Thins. Pure cherries (Maraschino, not Morello) pickled in peach juice, hold the brine. And not just any peaches: These are peaches stolen by St. Augustine; the ones that he didn’t write about. Rather they are the infamous peaches in Kitty Kelley‘s blockbuster Augustine: Unauthorized Confessions. The peculiar musk emanating from Reinhold Niebuhr‘s unauthorized biography of Quince, pickled in the tears of conflict peaches, and really old dried tarragon. Still off-script, you nudge the whisky (neat) near the Nepali’s nose, and the loosening of his grip combined with his beatific smile encourages you to taste the Artein. “Delicious!” you call, causing submachine guns and Lugers to point back at you! Cherry pie pressed in a panini-like cast-iron pizzelle-maker, a little seared, the bliss of the non-enzymatic browning of the Maillard Reaction, sprinkled with the frisson of physical peril. “Goddamn!” you shout. The Glenmorangieness of the Glenmorangie is more Angie than Glen, more Dickinson than Campbell, more Glentastic and Morangulous than imaginable. The Nazis and Nepalese look confused. You take advantage of this to wriggle free (off-script) and sip more Artein. Fruit (non-specified), guava nectar, and the mysterious allure of a woman silhouetted behind a rice-paper screen. The finish cloys like cling-peach meringue (the meringue being made from titmouse bird eggs, of course), and were you to plot it, you’d make it a great half-pipe of a convex function, rocketing down like Shaun White from fire to maximum velocity at the bottom to an incredible gravity-defying heavenward resurgence. The mouth and finish decisively answer the (not posed often enough) question of What happens after sugar is taken Up by the Rapture? 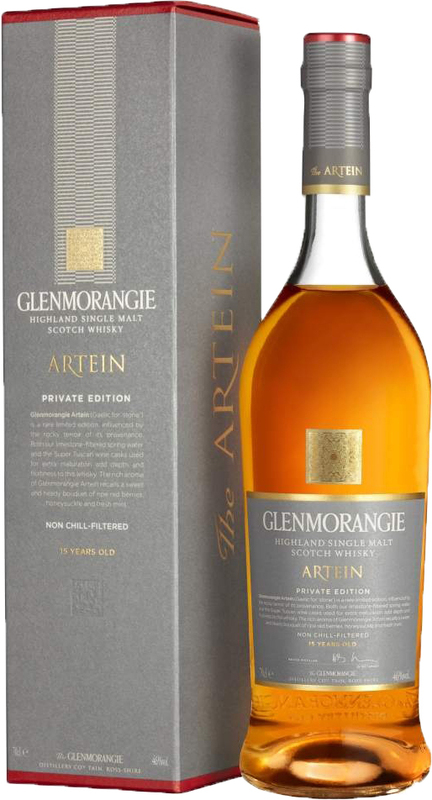 The Glenmorangie Artein is, of course, Eat a Peach–But it’s not the one you bought on vinyl, it’s the 2006 Deluxe Reissue with final 27 June 1971 Fillmore East concert. Yes, it’s got the 20:06 version of “Whipping Post“ on it. What more do you need besides that, a peach, a beach, and a glass of the Glenmorangie Artein? I submit the correct answer is: Nothing. Our thanks to Joshua Hatton for hooking us up with a sample!